This is from a variety of rose called Voodoo. 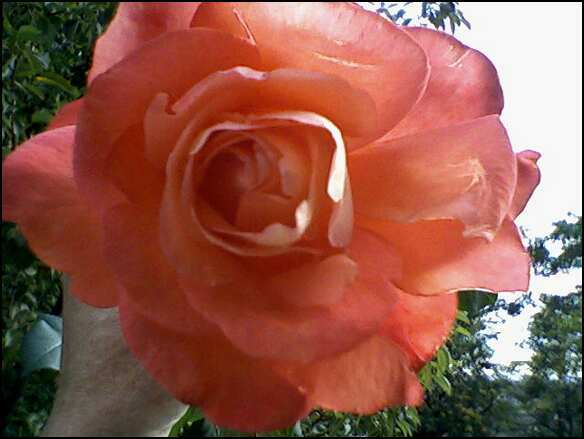 The color starts as a bright salmon color and changes to a dark rose color. Sometimes, in the right light (twilight or sunrise) the blooms almost look like they are glowing. I have the Abraham Lincoln variety too. That starts out a velvety red that changes to almost a black tinged shade. Here is a shot of the three types of tomato and one pepper that grew in the garden this year. 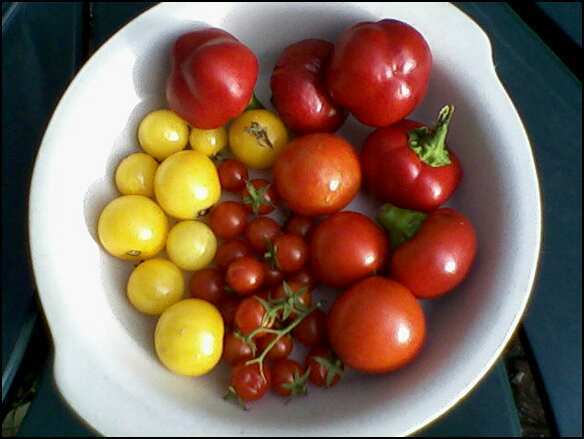 Pictured are: Golden Harvest (yellow cherry tomato) Fourth of July (red jumbo cherry) and the tiny red Sweet Snack variety. Also pictured is the Hungarian Cherry Pepper. This week I'll be firing up the old Aerogardens with greens and (what else?) Heritage Red and Golden Harvest Cherry Tomatoes, In the weeks after that it will be time to harvest whatever is left in the garden (cukes peppers, herbs) and prepare the cold frame for its winter occupants..